Over the course of a summer in a wealthy Connecticut community, a forty-something woman and her college-age stepson's lives fall apart in a series of violent shocks. Cheryl has never been the right kind of country-club wife. She's always felt like an outsider, and now, in her mid-forties--facing the harsh realities of aging while her marriage disintegrates and her troubled stepson, Teddy, is kicked out of college--she feels cast adrift by the sparkling seaside community of Little Neck Cove, Connecticut. So when Teddy shows up at home just as a storm brewing off the coast threatens to destroy the precarious safe haven of the cove, she joins him in an epic downward spiral. 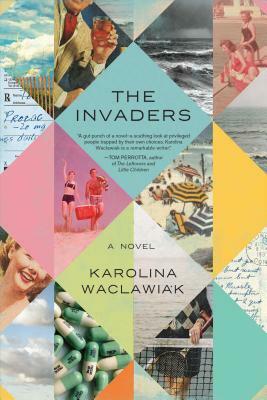 The Invaders, a searing follow-up to Karolina Waclawiak's critically acclaimed debut novel, How to Get Into the Twin Palms, casts a harsh light on the glossy sheen of even the most "perfect" lives in America's exclusive beach communities. With sharp wit and dark humor, The Invaders exposes the lies and insecurities that run like faultlines through our culture, threatening to pitch bored housewives, pill-popping children, and suspicious neighbors headlong into the suburban abyss. Karolina Waclawiak is a screenwriter and author of two critically acclaimed novels, How to Get into the Twin Palms and The Invaders. Her writing has appeared in the Los Angeles Times, The New York Times, VQR, and other notable publications. Formerly an editor of the Believer, she is now Deputy Culture Editor at BuzzFeed News.